CinemaCon: Women-led comic book stories are about to dominate the studio's slate, and three very different films offer looks at everything the genre still has to offer. Warner Bros. has plenty to celebrate when it comes to the studio’s slate of superhero features, from the box office-busting success of “Aquaman” to the highly anticipated opening of this week’s “Shazam!,” but at Tuesday afternoon’s CinemaCon presentation, the focus on the future turned to some new avenues: more films fronted and driven by women. Warner Bros. and DC’s upcoming slate of superhero movies features two much-hyped features that follow female stars, including Patty Jenkins’ “Wonder Woman 1984” and Cathy Yan’s “Birds of Prey,” and both films were teased in early footage. While Warner Bros. didn’t dedicate a full trailer reveal or in-person panel to either film, as they did with other big budget features like “It: Chapter Two” and Todd Phillips’ upcoming “Joker,” the panel did dedicate a segment to early looks and behind the scenes footage of both films, slated for 2020 releases. And, in hopes of connecting the rising DCEU into one big, happy bundle, “Aquaman” star Jason Momoa introduced the package via a pre-taped hello. For “Birds of Prey,” the sizzle reel served as a quickie introduction to a perhaps confusing-sounding story. As star Margot Robbie explained in a behind the scenes interview, her Harley Quinn isn’t actually one of the Birds of Prey, but she occasionally hangs with a “girl gang” that is “batshit crazy.” That crew actually includes Jurnee Smollett-Bell as Black Canary, Mary Elizabeth Winstead as Huntress, and Rosie Perez as Renee Montoya, all of whom also appeared in the reel, which briefly showed them off in costume and in various states of action movie-making magic. Still, with limited time on their hands, it’s no surprise that everyone eventually turned their attention to Robbie’s unique heroine, billed by the actress herself as “absolutely insane,” and back in pigtailed action after her introduction in “Suicide Squad.” What the reel lacked in actual, finished scenes (this film is still being made, after all), it made up for in pure hype (and at least one cut to Ewan McGregor as the film’s central villain). Though much has been made of the film’s ’80s setting, complete with first looks at Gadot in some radical period-approriate duds and even hanging out in a shopping mall, little has been revealed about the film’s central baddie, played by Kristen Wiig. The sizzle reel cleared that up, however, as Jenkins explained that her Barbara Ann Minerva is “sometimes a friend, sometimes a colleague” who “becomes Diana’s nemesis” in the film. 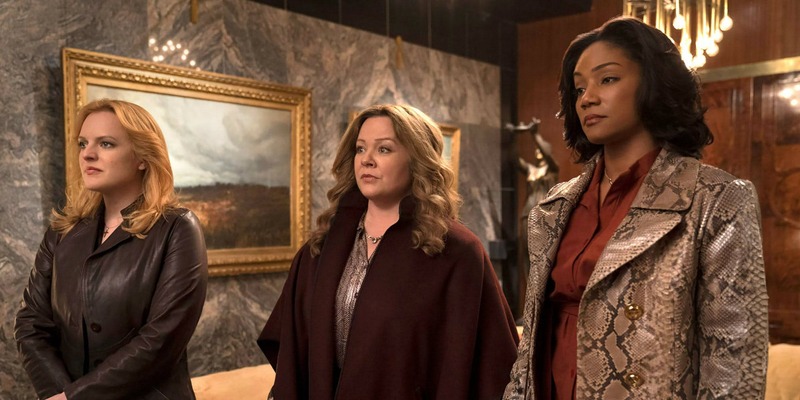 And while it’s not part of the DC Extended Universe, Warner Bros. has yet another female-focused graphic novel adaptation waiting in the wings: the Andrea Berloff-directed adaptation of the mafia story “The Kitchen,” which features Melissa McCarthy, Tiffany Haddish, and Elisabeth Moss as women pushed to the edge (and to a life of crime) in a surprisingly dramatic new spin on the genre. The fall film’s first trailer played well with the CinemaCon crowd, offering a dramatic adult story inside some familiar trappings. And McCarthy and Haddish, both best known for their comedic work, made a strong play for their more hard-hitting chops in the first look. The same could be said of the comic book and superhero world, too. Warner Bros. will open “Wonder Woman 1984” on June 5, 2020; “Birds of Prey” on February 7, 2020; and “The Kitchen” on August 9, 2019.